I love eating Japanese food. I can’t think of a better example of how the presentation of food makes all the difference. Even if I put away a mountain of rice and a whole salmon, the fact that I have daintily eaten with chopsticks from neat, symmetrical piles lets me still feel elegant. Generally I’m not one for small portions, so I thought this would be a nifty trick for me to learn. I wanted to make a Japanese-influenced meal that would be satisfying but still delicate. This dish keeps the fun dipping action and the neatness of sashimi, in a grilled rather than raw form. 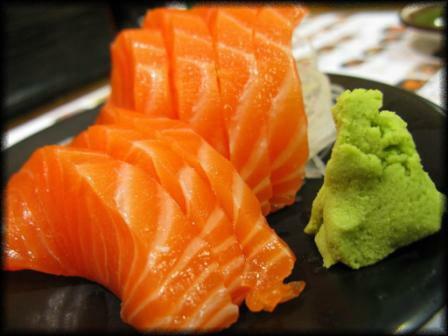 The wasabi pea puree is the filling part and also gives the dish a kick. The dressing/dipping sauce holds the zing so encourage your guests to be liberal with it. The sugar snap pea tempura is a cheeky bit of showing off. But what fun is cooking for others if you don’t get to show off from time to time? These were so good that I wanted more than three but we’re trying to be elegant here, so I held back. This dish is easier than it looks. Just a little care with the plating makes it look really appetising and as though you’ve made a big effort. It’s also (apart from the tempura) a very healthy and low-carb meal. Enjoy! First, measure out 100ml water into a mug and put it in the freezer so you have ice cold water for your tempura later. Start preparing the salmon. If the fillets aren’t already skinned, gently remove the skin. Cut the fillet into four equal chunks and place in a dish – don’t mix the chunks up because you’ll reassemble the fillet when you plate up. Mix together the marinade ingredients (except the sesame seeds) and pour over the salmon. Put in the fridge to marinate while you prepare the other ingredients. Turn over after 10 minutes. Then make the pea puree. Cook the peas in boiling salted water for a few minutes. Drain and run under cold water. Put the peas in a blender or food processor along with the other puree ingredients. The puree should be quite but not too solid, so add a tablespoon of water if you need to. Also add the wasabi paste in stages and keep tasting – not all pastes are the same strength so you may wish to use more or less than I have done. Next make the dressing/dipping sauce. Very finely chop the ginger and garlic and place in a jar. Add the other ingredients, put the lid on and shake well. Then make the salad. Cut the avocado in half and then into thin strips lengthways. Peel and deseed the cucumber and cut into strips lengthways. Trim the sugar snap peas and cut in half lengthways. Put the salad vegetables in a bowl with a handful of rocket leaves. Dress with 2tbsp of the dressing and toss. You can start plating up already – put a pile of salad at one end of the plate and a small pile of the puree at the other. You can use a small pastry cutter to get a neat circle of the puree. Shake the remaining dressing and place in a small dipping dish. Turn on the grill. Reassemble the salmon fillets on a baking sheet, keeping them in the same order as the original fillet. Sprinkle with sesame seeds and place under the grill. They will take about 7-10 mins to cook – keep an eye on them so they don’t burn. While the salmon is cooking, quickly make the batter. Spoon the flours and salt into a bowl and gradually add the ice water from the freezer, stirring with a small whisk or fork. Don’t make it too runny because it needs to stick to the peas – it should coat your whisk/fork. Heat 1cm vegetable oil in a small pan. Test the oil to make sure it’s hot enough by dropping a tiny bit of batter into it – it should bubble instantly. One at a time, dip the sugar snap peas in the batter, making sure they’re coated all over and carefully drop into the oil. You may want to do this in two batches so the peas don’t stick together and it’s easy to turn them. Remember to check on your salmon! It should be a deep brown glaze on top but not burnt, and nice and firm to the touch. Gently turn the peas as they are cooking and once they are brown on both sides remove from the oil and place on a piece of kitchen roll to absorb excess oil. By now the salmon should be done. Transfer it to a plate, reassembling the shape of the fillet. Stack three sugar snap pea tempura on top of the pea puree and serve. Enjoy! Can you please send some to Seoul? I want this now!! !so tempting.following your blog,please follow mine.